Haleem is a traditional Pakistani dish made with four lentils, cracked wheat and meat. It can be made with chicken, beef or mutton meat; but the real haleem is made with beef. 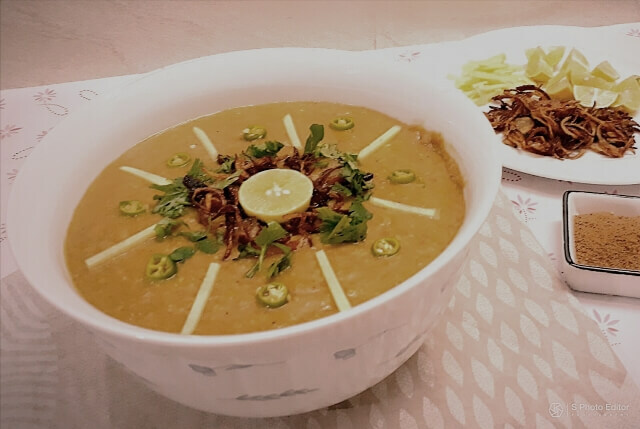 Beef haleem is deliciously served with crispy fried onion, Julian ginger, green chilies, lemon wedges and chaat masala. You can also use homemade haleem masala in it. Just cut down the quantity of spices into half. Soak wheat grain in a separate bowl for overnight. Soak all lentils in a bowl for 2-3 hours. Boil all lentils in a large pan with 6 glass water and 1 tea spoon turmeric powder until tender and mushy. Boil wheat in a separate small pan with 2 glass water and ¼ tea spoon turmeric powder until tender and mushy. Heat oil in a deep pan and fry onion to golden brown color. Sauté ginger, garlic paste and whole spices about 3 minutes then add meat and cook. Then add tomatoes, green chilies, red chili powder, remaining turmeric powder, coriander powder and salt. Cook for a while then add sufficient amount of water to tender the meat. Cook until meat soft and tender. Now mix the lentils and wheat grains with the meat and mix well properly. Let it cool a little that you can handle easily. Now grind in a food processor. Place the pan on fire and cook more over low heat about 10-15 minutes until thick. 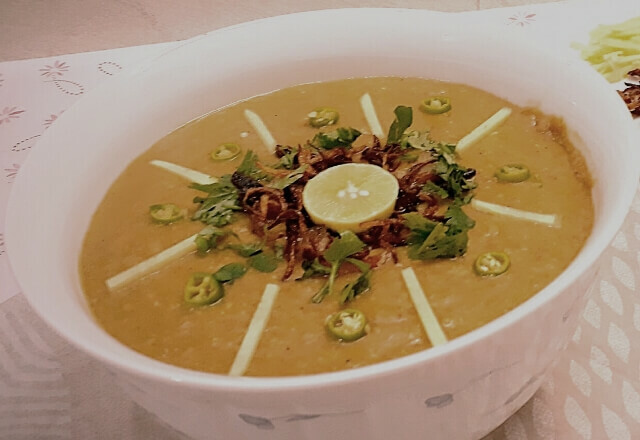 Arrange crispy onion, green chilies, julian ginger and lemon wedges in a plate and serve haleem with hot Naan.